1996-1997 - Attendance for the San Jose Arena, San Jose, California. 1998-1999 - Attendance for 25 games due to NBA lockout. 2011-2012 - Attendance for 33 games due to NBA lockout. I want to personally welcome you to the ultimate entertainment experience, the New Arena at the City of Oakland and County of Alameda Coliseum Complex. Whether it is your first year or sixth decade following the Warriors, we are committed to making each game and event a spectacular day or evening of entertainment at our New Arena. There are only two things that are not brand new; the roof and the "jewel box" exterior wall. Our New Arena will provide you with a sports theatre that has the best sight-lines in the National Basketball Association. This New Arena is destined to set the standard for excellence that other arenas will emulate. The New Arena is designed explicitly for basketball; not a hockey-designed building like the vast majority of new arenas. Fan comfort will increase dramatically from the old arena. There will be two and one half times the restroom facilities. You will now have five concourses along with a wider selection of food and beverage items to provide you the very best service. The old arena had only two concourses. We have also made this New Arena accessible and convenient to our guests with disabilities in accordance with the guidelines set by the Americans With Disabilities Act (ADA). The New Arena will also feature the best in state-of-the-art sound and video technology. Our primary goal is to build a championship caliber team. Our new practice facility in downtown Oakland will be completed at the end of the year. Now, the Warriors will have the best practice facility in the NBA. Join us in the ultimate arena experience, and do not miss the Warriors inaugural season in our New Arena! Nearly two years after Sam Skinner's death, the Warriors yesterday officially unveiled their tribute to the longtime Bay Area journalist, naming the media lounge and workroom in the new Oracle Arena after him. Skinner, who in the 1960s became the first black sports journalist to gain prominence in the Bay Area, died in 1996 at age 56. Skinner had run his own syndicated news service and also worked for AP, UPI, Mutual and ABC. A California arbitrator has ruled the Golden State Warriors must pay the Oakland-Alameda County Sports Authority $17 million from premium seating revenue and a 5% ticket surcharge not paid for two years. The payments were withheld after the signing of a new lease in 1996 coupled with improvements in the Coliseum. The lease locked the team into the venue for 20 years. The amount will be reduced by $720,000 as compensation to the team for moving into the arena, according to the arbitrator's ruling. Still to be decided is a dispute over seat licenses that were to be sold to reduce the remodeling debt. The team decided after the agreement not to sell licenses. That issue will be heard in November. January 15, 2000 - The "new" arena here in Oakland opened in 1966, and the facility underwent a massive renovation just a few years ago to bring it to its current state. It is primarily the home of the Golden State Warriors, and history buffs can remember that the ABA Oakland Oaks won their first and only league title in this very building in its inaugural year. The arena was getting ready to host the 2000 NBA All Star game. You can find this building right next door to Network Associates Coliseum, home of the Raiders and the Athletics, and has easy access via a nearby BART rail station and sufficient parking areas. We had just arrived earlier in the day, and were looking forward to our first event in California. Our hotel was close enough to actually see the arena in the distance, but still a drive, so we headed out to find a cool restaurant and then the game. Only problem is, there was absolutely no place we could find that looked halfway decent. We kept widening the circle, and plunged ourselves into some dreary and depressing neighborhoods that abut this sports complex. Basically, just not a great destination. The arena itself looks pretty imposing, with grand staircases which lead you to the entrance door. We assume that there are better ways to get in for the physically challenged. The concourses are pretty ordinary, and the fan amenities available require a walk back downstairs.. for example, the team store, very large and well stocked, required a walk down off the main concourse. Club seat amenities, such as the Courtside Club, are also located on the ground level. The seating bowl is octagon shaped, with an eight sided scoreboard in the center. We had seats in the second row in the upper deck, and the pitch was such that our view of the court was partially obstructed by the guy sitting in row 1. Pretty bad! The suites ring the arena above the 100 level. Another interesting feature to note is that the retired numbers of the team appear as backlit panels along the sideline balconies. Those backlit panels include Wilt Chamberlain, Rick Barry, Nate Thurmond and Al Attles. Their one world championship was in 1975. They gutted this building and rebuilt it from top to bottom, but the result is still a very plain arena with nothing outstanding to remember it by. The team is mired in the dumps, and the night we were here there was a huge contingent of Sacramento fans who made the 80 mile trek to cheer for their team. Otherwise, just a bland and ordinary experience... hopefully things get better as this road trip progresses. Reports from Yahoo! Sports say there is a well-moneyed and politically connected Bay Area group that has approached NBA Warriors Chris Cohan about purchasing the team and building a privately funded arena in downtown San Francisco. The group has already had third parties call several well-respected NBA front-office executives about running the team, the reports say. Larry Ellison, CEO of Oracle, is also reportedly interested in the team. Oakland, Calif. - If new owners of the Golden State Warriors want to move to the team a new arena in San Francisco, they would face negotiations over a lease that binds the team to Oracle Arena in Oakland through 2017. Deena McClain, executive director of the Oakland-Alameda County Coliseum Authority, which controls the arena, said that after the 2017 lease, the contract includes language for two five-year extensions running through 2027. During that period, any owner moving the team would be on the hook annually to pay any debt service remaining on the bonds used to fund the renovations the arena could not cover. The Warriors pay $7.4 million annually toward the debt service. Alameda County Supervisor Scott Haggerty, who heads the Coliseum Authority board, said he has no plans to let the Warriors leave their home. "I have no desire to see the Warriors leave the East Bay," he said. "The Warriors are a valuable ticket. I mean that. We have a great fan base here and a great arena. We just need an owner committed to winning." A move would seem years away even once a buyer is found. Oracle Corp. CEO Larry Ellison, an avid NBA fan, has reportedly expressed interest in buying the team. As many as six parties could be interested, including 24 Hour Fitness founder Mark Mastrov. The purchase price is said to be $400 million. The development team - which includes the San Francisco Giants - looking to build a 16-acre mixed-use project across the Lefty O'Doul Bridge is close to winding down negotiations with Port of San Francisco planners. That is the site rumored to be the location of a new arena. Byron Rhett, director of planning and development at the Port of San Francisco, said the Giants and the rest of the development team are likely to go before the Port Commission in the next month or so to receive approval for the development and enter into an exclusive negotiating period during which entitlements and environmental impact reviews will be hashed out. Rhett said at that time details about the project would have to be finalized in order for the development to move forward. Though most of the project's details are not final, the development - called the Mission Rock District - does not call for a large arena that could house a professional basketball team. The plan does call for the possibility of a 5,000-seat entertainment or music venue just across the China Basin Channel from AT&T Park. Rhett said the venue had been part of the original development proposal, but had been taken out. It recently was added back to the plans. One of the developers joining the Giants on the Mission Rock venture is Baltimore-based The Cordish Co. Cordish is developing a handful of mixed-use projects adjacent to sports facilities around the country. In November, the company was given exclusive rights for two years to come up with a proposed entertainment district in Las Vegas, which includes plans for a sports arena. It would be Cordish's first such facility. Oakland, Calif. - A disagreement between the Golden State Warriors and the Oakland- Alameda County Coliseum Authority has put $10.7 million in back rent and fees in dispute, according to the Oakland Tribune. The Warriors stopped paying bills in 2006, just four years after the organization settled a previous $25 million dispute with the authority over payments for its lease. While the authority immediately notified the team that it was in violation of its lease agreement, it decided not to press the issue in the courts because of rumors that owner Chris Cohan was looking to sell the franchise, the newspaper said. That opinion changed late last year when the Warriors filed a claim with an arbitrator saying the authority owed the organization money for a new scoreboard it installed and had failed to schedule enough non-basketball events at the Oracle Arena. Under the current lease agreement, the two sides share certain revenues for events, such as concerts, that are held at the arena, the newspaper reported. The authority responded with its own claim that the Warriors were refusing to pay more than $10.7 million in fees. Just as both sides were about to make their case before an arbitrator in July, the Warriors requested a delay because of the sale of the franchise to Boston Celtics minority partner Joe Lacob and Mandalay Entertainment CEO Peter Guber. While the authority agreed to delay arguments on the Warriors original claim, it refused to agree to delay its $10.7 million claim. Retired Judge William Cahill, the arbitrator in the case, sided with the authority, ruling that arguments on the original claim would be delayed but that the authority's counterclaim would continue. Last month, Cahill reached a decision agreeing with the authority that the Warriors owed the public more than $10.7 million. In addition, Cahill ruled that the team could be held in contempt of court for knowingly refusing to pay its bills. Although the Warriors have yet to schedule a hearing on its original claim, the organization filed a lawsuit this month asking a San Francisco Superior Court judge to overturn Cahill's rulings, the newspaper said. Oakland, Calif. - The new owners of the Golden State Warriors have paid $10 million to the Oakland-Alameda County Coliseum Authority that was incurred under the previous owner, the Oakland Tribune reported. The payment ended part of a dispute the team had with the authority over lease payments and a disagreement over who should be responsible for paying for a new scoreboard at the Oracle Arena. The Tribune said it immediately sparked the thawing of a litigious relationship between the two that began almost immediately after Chris Cohan purchased the team in 1995. "This new posture taken by the Lacob group was a very important first gesture and has been much appreciated by the Oakland Alameda County Coliseum Authority," Jon Streeter, an attorney representing the authority, told the Tribune. "We learned long ago with Cohan that he'll never part with a nickel until judgment is entered against him, every appeal is exhausted and the sheriff is about to show up at his doorstep. The spat between the authority and the Warriors began in 2006 when the Cohan-led organization stopped paying lease payments to the authority for the right to play at the Oracle Arena. Cohan claimed in legal filings that he decided to stop paying rent because he believed the authority owed the Warriors money for a new scoreboard that had been installed at the arena. The team also said, in legal filings, that it was due money because the authority had failed to generate enough money through concerts and other shows at the arena. 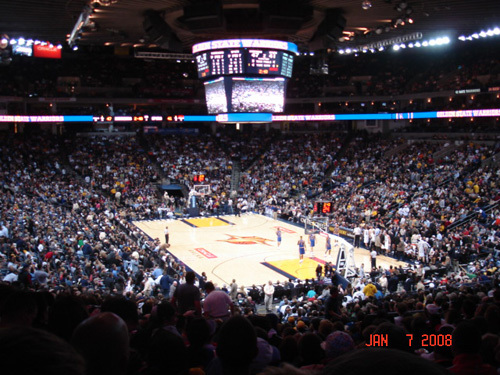 Both the authority and team share certain revenues from non-basketball events hosted at Oracle Arena. While the authority immediately notified the team that it was in violation of its lease agreement, it decided against suing the team because of rumors that Cohan was looking to sell the team. The Tribune said that decision changed, however, when Cohan filed a lawsuit against the authority before the sale of the team was completed. The case was eventually brought before an arbitrator, who ruled that the Warriors were not legally permitted to withhold lease payments. A decision on who is responsible for paying for the new scoreboard is still pending. Raymond Ridder, the team's executive director for public relations, declined to comment for the Tribune. Nevertheless, Streeter said he believes that the disagreement over the scoreboard costs will be settled in an "amicable basis." Oakland, Calif. - The litigious relationship between the Golden State Warriors and their landlord may be over � and improvements to Oracle Arena should be the result, the Oakland Tribune reported. Alameda County and Oakland officials gave final approval to a settlement that ends a more than five-year dispute between the team and the Oakland Alameda County Coliseum Authority. The deal calls for the authority to upgrade the sound system at the arena, as well as start a $4 million "upgrade fund" to improve the fan experience at the arena. The authority also will pay an additional $3 million to end litigation over the dispute, the Tribune said. The disagreement between the authority and the team began in 2006 when the Warriors stopped making payments to the authority to play at Oracle Arena. In May 2009, the team claimed in legal filings it had stopped paying rent because the authority had shirked its obligations by not paying for a new scoreboard the team installed and by failing to book more concerts and shows at the arena. The authority and the team share some revenue from non-basketball events hosted at the arena. The authority eventually filed a cross-claim for back rent, and late last year � just after taking over the team � the Warriors' new ownership of Joe Lacob and Peter Guber sent more than $10 million to the authority to settle that debt. The deal - which was approved by the authority last month but also needed the approval of the Alameda County Board of Supervisors and the Oakland City Council - settles the Warriors' initial claims. As part of the settlement, the authority also agreed to replace the corner scoreboards in the next fiscal year. Also, during the next three years, the authority will set up the $4 million upgrade fund that the Warriors can draw from to make unspecified improvements to the arena. "It's a good deal for the county and city," Supervisor Nate Miley, who also serves on the authority's board of commissioners, told the Tribune. Oakland, Calif. - Competitors will have a chance to state their case for why they should manage the Oakland Coliseum instead of SMG, which has run operations there for 13 years, the Oakland Tribune reported. Two operators have already surfaced. One is Global Spectrum, a subsidiary of Comcast-Spectacor, and SMG co-owner until 1998. The other contender is AEG, which owns Staples Center in Los Angeles and belongs to Philip Anschutz, owner of the San Francisco Examiner. Besides the Examiner and AEG, Anschutz's portfolio includes the Los Angeles Lakers, Regal Cinemas, The Weekly Standard and, previously, telecom giant Qwest Communications. 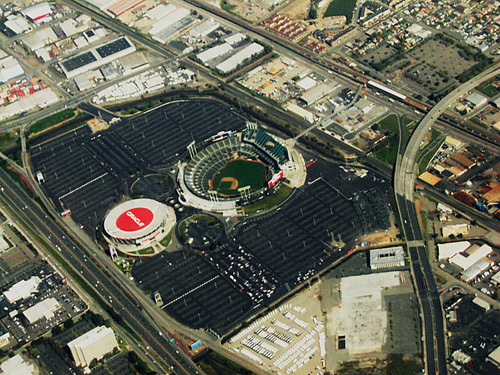 The municipally owned and subsidized sports and entertainment complex, made up of the Oracle Arena and Oakland Coliseum, will still be governed by the Oakland-Alameda County Coliseum Authority board. The Tribune said commissioners appeared ready to start negotiating a 10-year no-bid contract extension with SMG during a regular meeting. The other option involved soliciting bids from other potential operators. The option seemed remote until Authority Commissioner Desley Brooks said the coliseum operates under the same contracting rules as the city of Oakland and must issue a request for proposals. The Tribune said the bids could start rolling in by September. SMG could still come out on top. But, Commissioner Scott Haggerty said, "This commission can gain a lot by at least testing the market." The Tribune said SMG offered to sweeten the deal with a $1.5 million "capital contribution" that can be used for whatever the Coliseum Authority sees fit. SMG would recoup its contribution in about two years. SMG is paid a flat $200,000 plus incentive fees based on revenue. Last year the authority paid them $616,312 during fiscal year 2009-10. The balance of the "capital contribution" would be returned to SMG if the board decided to exercise an option to shorten SMG's contract by five years. Their competitors are likely to offer a bigger sweetener. The details, however, won't be known until after the next board meeting on Aug. 19. Commissioners asked the newly appointed coliseum executive director, Mark Kaufman, to prepare a request for proposal by that date. Kaufman is a former SMG general manager. San Francisco, Calif. - The Golden State Warriors have met with San Francisco Mayor Ed Lee and Giants CEO Larry Baer to discuss the feasibility of building a new, state-of-the-art arena near AT&T Park that would open before the 2017-18 season, the San Francisco Chronicle reported. Warriors owners Joe Lacob and Peter Guber have talked about the need to replace Oracle Arena in Oakland since buying the basketball team in July 2010, but this is the first time they have publicly stated their intent to explore options in San Francisco. They have also had discussions with Oakland Mayor Jean Quan about building an arena at their current East Bay site. "The potential for building an arena near AT&T Park is very exciting," Lacob said. "The Giants have done some remarkable things over there. It's a great ballpark that revitalized an entire part of the city. "It took a year to get our feet wet, examine the organization and make a lot of changes. Step 2 is starting the process of getting a new arena somewhere in the Bay Area. We're a Bay Area team. We consider the whole Bay Area our market, whether we're located in San Francisco or Oakland." Lee reached out to the Warriors and Giants to set up the meeting. The Warriors then contacted Quan and scheduled an advance meeting. Lacob and team President and Chief Operating Officer Rick Welts met with Quan, informing her about the upcoming meeting with San Francisco's mayor. They also said they planned to start studying development options for a new arena, including in Oakland. The Warriors brass met with Baer, Lee and Jennifer Matz, the city's top executive for economic development. 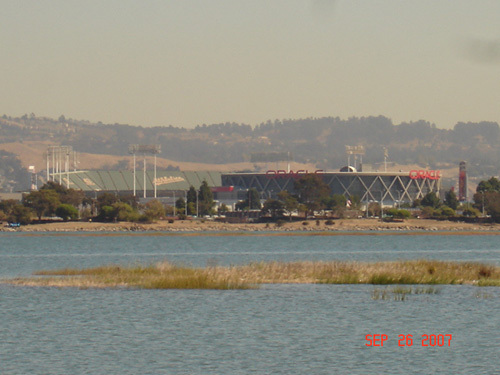 Lee encouraged the Warriors and Giants to explore realistic sites on land south of AT&T Park. "This is a great opportunity for San Francisco, and I'm going to make sure the Warriors know that we are ready to welcome them back home," Lee said. "I asked the Giants to join us because of their considerable expertise in building a world-class sports arena in a dense urban setting, their partnership with us, and their reputation for being a good neighbor and just a valuable asset to the city in many ways." In his dual roles as the Giants' chief operating officer and president of the China Basin Ballpark Corp., Baer was the driving force as San Francisco opened then-Pacific Bell Park to widespread acclaim in 2000. "Building a new facility - whether it's an arena, a stadium or a ballpark - is exciting," Baer said. "It's something that is coming out of the ground, and it's a vision. It's really exciting stuff. It could be a dramatic and amazing development here." The Warriors' lease at Oracle Arena runs through the 2016-17 season. The arena, built in 1966, is the oldest in the NBA - two years the senior of New York's Madison Square Garden - but it was extensively renovated in the mid-1990s. 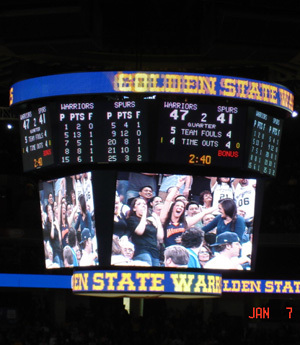 Lacob and Guber recently approved new flat-screen TVs in Oracle suites, and are hoping that a high-definition scoreboard can be added before the Christmas-night opener. They have also updated the sound system, installed four new LED scoreboards in the upper corners, renovated the locker rooms and added Wi-Fi throughout the arena. "We agreed to explore all feasible options over the next 68 months," Welts said. "Where it goes, where it ends, that will have to play itself out over the next many months." The Oakland Tribune said San Jose was quick to add its interest in the Warriors. Mayor Chuck Reed invited the NBA team to "move to San Jose. We have room for them in HP Pavilion." Malcolm Bordelon, executive vice president of business operations for the San Jose Sharks, told the Tribune the hockey team would "be happy to explore options" with the Warriors. Bordelon said there have been no negotiations or a "formal type of approach" by the Warriors to move to San Jose. Still, Bordelon said, "it's certainly a topic that may pop up." San Francisco, Calif. - If the Golden State Warriors want a new arena in San Francisco, Mayor Ed Lee has two words for the team: private financing. The San Francisco Examiner said the basketball franchise makes its home in Oakland's aging Oracle Arena, the NBA's oldest functioning facility. But the Warriors are considering options for a new stadium in 2017 when its Oakland lease runs out, and the team has been in discussions with the Mayor's Office and the Giants about a new home near AT&T Park. "If there's anything I've learned, it's that sports teams are also businesses, and they want to be successful as well," Lee said during an economic forecast event in Oakland. "The Giants have been extremely successful owning their own stadium." San Francisco voters have traditionally resisted backing sports stadiums with public money. The Giants pushed two ballot proposals in the late �80s for a partially taxpayer financed waterfront stadium, but both were rejected. In 2000, the Giants opened the first privately financed Major League ballpark since Dodger Stadium was constructed in 1962. "It's their private investments that have to be laid out there," Lee said of the Warriors. "I'm hopeful sports teams will look at San Francisco, and not just for their sports. ... The venue has to be successful well beyond those games." The Warriors offered no comment on the mayor's remarks and referred to a December statement saying the team is mulling its options, including Oakland. Oakland Mayor Jean Quan, who spoke alongside Lee, has floated the idea of a "Coliseum City," an integrated three-stadium complex designed to retain the Warriors, A's and Raiders - all of which have considered moving.